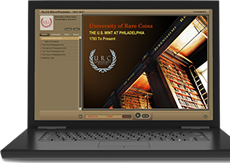 The University of Rare Coins is where classes are always in session, anytime, anywhere, 24/7/365 with an internet connection. These interactive online courses are filled with business knowledge with dozens of modules to choose from, covering hundreds of business topics. Browse our catalog of courses below, and click on any of the Training Suites to learn about more specifics on each course... Then just login and launch the business curriculum of you choosing. If a course doesn't open within a few seconds it is most likely a "Pop-Up" Blocker. Be sure to allow "Pop-Ups" to URC. You only have to do this once (per computer), and then just re-open the course again. URC Courses are filled with multimedia interactions with narration and music. Be sure you speakers are turned "ON" and not muted, and turn-up the volume to a comfortable level. URC automatically remembers where you left off in a course. If you need to exit out of a course that you are still in progress in, URC will prompt you when you re-open the course, and ask if you want to resume the course where you left off. Passing score is 80% on the final Retention Test for Course Credit. Don't worry if you miss an answer, you can always reopen the course, and then scroll down to the Retention Test and retake the quiz again. You receive URC Credit for every course you pass. You can view your Transcripts at the link on the bottom of each web page.